If you are interested in purchasing organic and Fairtrade coffee from Ethiopian farmers, we have paired with Just Love Coffee for an adoption fundraiser. 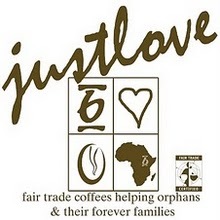 Just Love Coffee sells organic and Fairtrade coffee from around the world and donates $5 a bag to us for our adoption. "Until one is committed, there is hesitancy, the chance to draw back, always ineffectiveness. Concerning all acts of initiative and creation, there is one elementary truth, the ignorance of which kills countless ideas and splendid plans: that the moment one definitely commits oneself, then providence moves too. All sorts of things occur to help one that would never otherwise have occurred. A whole stream of events issues from the decision, raising in one’s favor all manner of unforeseen incidents and meetings and material assistance, which no man could have dreamed would have come his way. Whatever you do, or dream you can, begin it. Boldness has genius, power and magic in it. Begin it now." - the German philosopher, Johann Wolfgang von Goethe (1749- 1832).